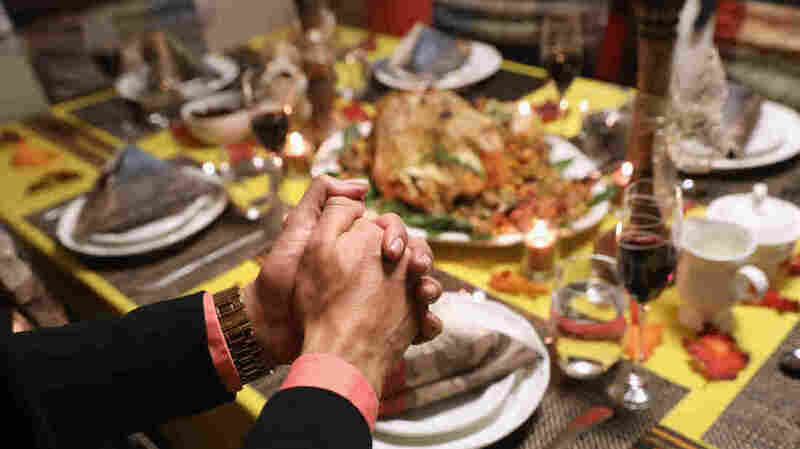 NPR Politics Podcast: This Thanksgiving A Majority Would Prefer To Hold The Side Of Political Talk In the latest NPR Politics Podcast, we explain why Democrats and Republicans are feeling so differently about the inevitable talk of politics during the Thanksgiving holiday. A Thanksgiving dinner table setting on November 24, 2016, in Stamford, Conn. This year, even more than last year, people are dreading talking politics over Thanksgiving dinner. A new NPR/PBS NewsHour/Marist poll finds that 58 percent of people celebrating the holiday are not excited about the prospect — and Democrats are less excited than Republicans. "Why is that? Obviously, Donald Trump is president, and that's the out party for Democrats," says Domenico Montanaro, NPR's lead political editor. "And to that point, Democrats are saying that they find conversations with people who have a different opinion about Donald Trump quote stressful and frustrating. Compare that to Republicans? More than half of Republicans say that they find those conversations 'interesting and informative.' "
Allegations of sexual harassment, including against Sen. Al Franken, D-Minn., and Rep. John Conyers, D-Mich., were in the political headlines during this holiday week. Even before the latest Franken and Conyers stories broke, the Senate and House were moving to change rules about sexual harassment training and reporting. NPR congressional correspondent Susan Davis says, "I think that there was a self-awareness that Capitol Hill has, by reputation and by reality, been a place in which harassing and discriminatory behaviors of all varieties — not just sexual harassment — that it's been a permissive atmosphere. And that that needs to change." And, in keeping with White House tradition, President Donald Trump pardoned a turkey Tuesday. Montanaro, who started researching the turkey pardon 8 or 9 years ago, is full of fun turkey pardon facts. Including this one: "Lincoln is the first on record to pardon a turkey. But it was a Christmas turkey that his son had taken a liking to, and they basically kept as a pet for a little while. So that's not quite the same as a Thanksgiving turkey." For more fun facts — and to hear what the politics crew can't let go this week — listen to the NPR Politics podcast.